This edition of The Confessions comes complete with all 13 books, a Touch-or-Click Table of Contents broken down by book and chapter. This classic work, The Confessions, was translated into several languages and played an important role in the spreading of the ideals of Eastern and Western Christianity. Augustine of Hippo, also known as Augustine, St. Augustine, St. Austin, St. Augoustinos, Blessed Augustine, or St. Augustine the Blessed, was Bishop of Hippo Regius (present-day Annaba, Algeria). He was a Latin-speaking philosopher and theologian who lived in the Roman Africa Province. His writings were very influential in the development of Western Christianity. 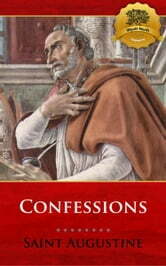 According to his contemporary, Jerome, Augustine established anew the ancient Faith. In his early years he was heavily influenced by Manichaeism and afterward by the Neo-Platonism of Plotinus. You can purchase other wonderful religious works from Wyatt North Publishing.